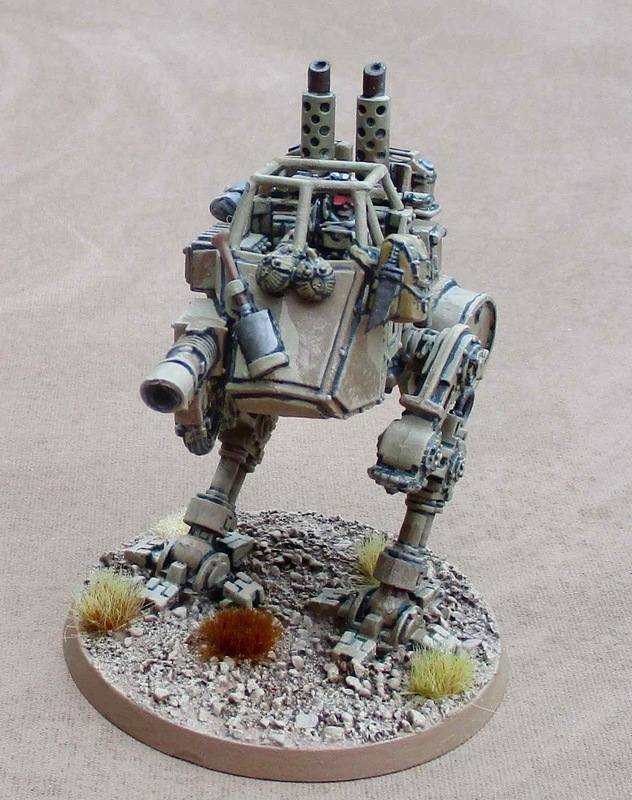 I love these little scout sentinel walkers. I think their fun models and the fluff is fun. I have no idea if they're at all useful in the game. I had an idea that I'd like to do a few of these up to look like something like the Long Range Desert Group trucks or Special Air Service jeeps from World War Two - festooned with kit necessary for long range reconnaissance missions deep behind enemy lines. I'm not sure if there's enough kit on here... or too much? There isn't a lot of places to OUT extra kit on these little guys. The braces for the giant promethium fuel drum I cut out of plasticard. The bins for the Jerry Cans are just bent wire - I imagined those would have water in them. I even had this crazy idea that I could do an entire "Outrider Detachment" of these - ten of them! like an SAS raiding Squadron. There'd be three units of three plus a command one. 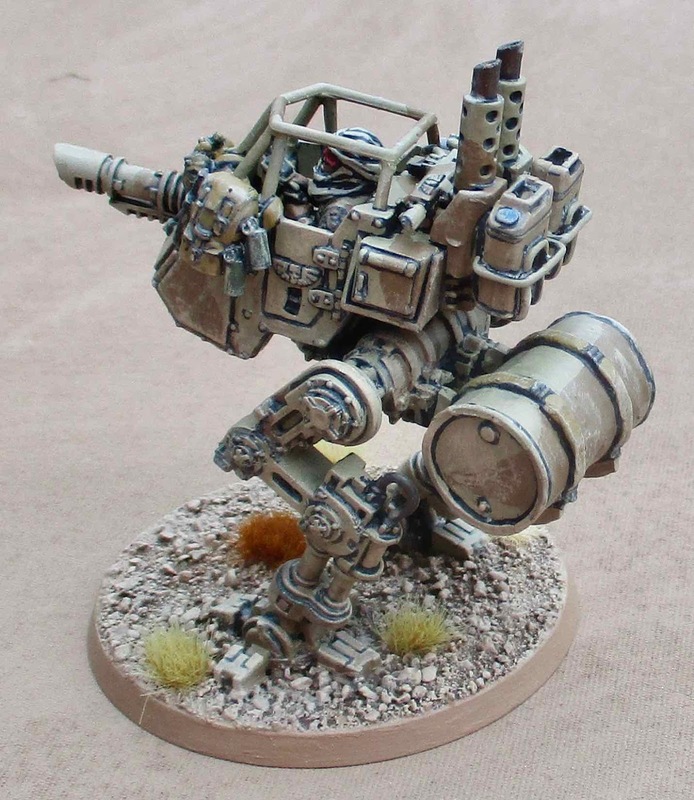 Of course there are no rules for a commander in one, but I figured if I paid for a tank commander less the cost of a Leman Rus and adding the cost of a Scout Sentinel that might work, right? Alternatively, I thought for the command element I could put a company Commander in a Taurox (with one of the wheeled suspension kits available from Victoria Miniatures)...? I have some Shadespire miniatures on the workbench I'm painting for a friend. They'll probably be the next miniatures I finish. 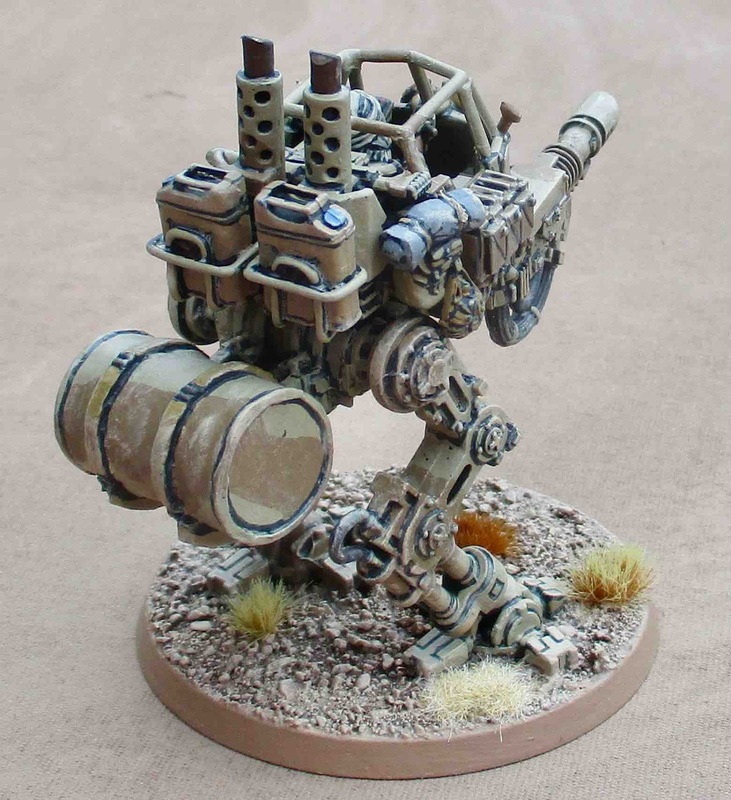 Nice looking long range recon walker, I like the big fuel tank and the jerry cans, so you've been looking at more than just lasguns at Victoria miniatures then? Good luck with the kitchen I've almost finished mine! Yeah Victoria miniatures does have a LOT of fun little things. 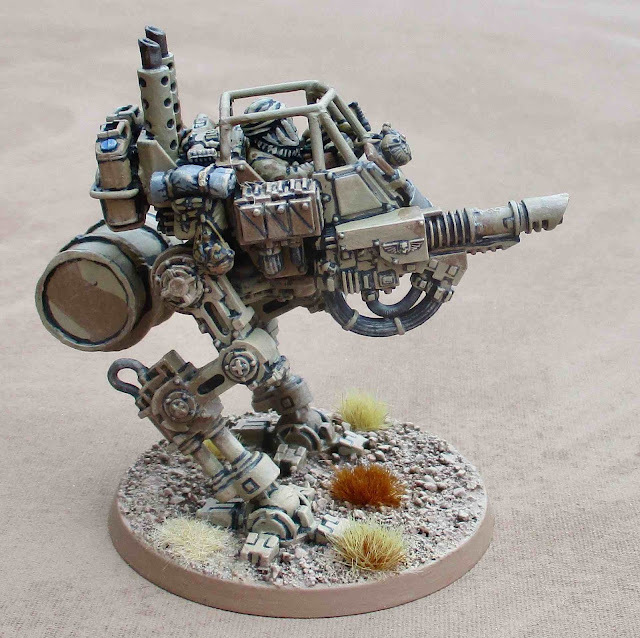 I love the look of the wheeled Taurox. The regular taurox with the tracks just looks stupid - and don't get me started on the auto cannons mounted on the back of the chassis BEHIND the freaking doors!? I realized, looking on their site, that the BFG I got from the Bones III Kickstarter was designed by them - and now sold through their website. I'm planning to use mine as an Earthshaker Carriage Battery. I'm torn as to what I should do with the crew - paint them as is (like some supporting Moridian unit - which I'd have to put in a separate detachment or lose regimental bonuses) or convert them to look like Tallarn...? Anyway, like all the additions you have made. I went a bit overboard when these were first put out, and have something like 12 of them, mostly unpainted of course! Well they used to be available in those boxed set of three... so... Why wouldn't you have twelve!? 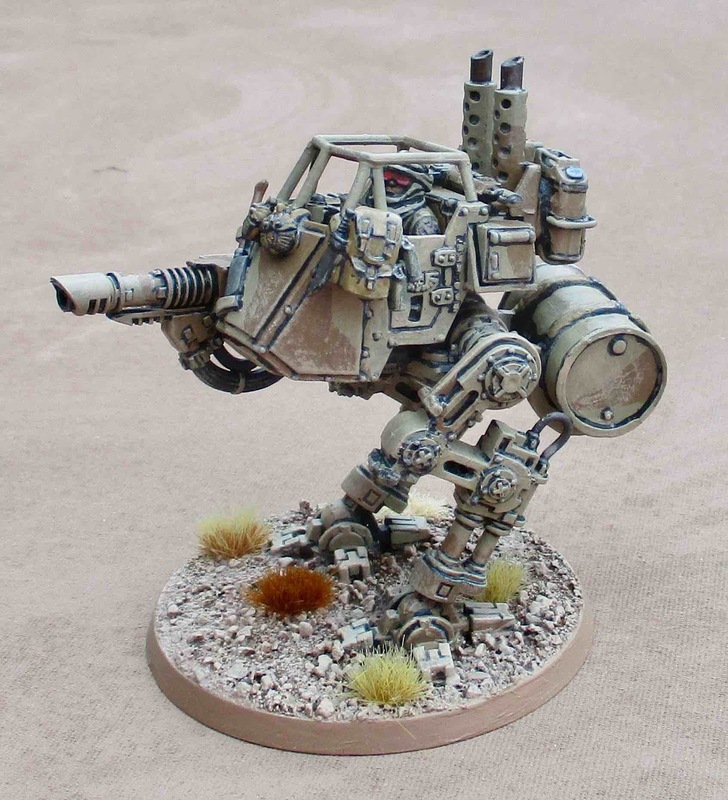 I remember reading a lack library novel about the Tallarn and the Scout Sentinel patrols featured in them at some point and they were portrayed a swiftly running across the dunes, doing their recce thing along with hit and run raids and ambushes, slowing the enemy advance. Looks brilliant mate. Love all the detailing! Great work Tim - looks amazing.